I again used Simplicty 2677 to make a yummy top for Zoe. After I made a pair of pink pants, I thought she would need at least two tops so she could wear the pants. The second top I made her is from the CC Abbie pattern a long time favorite. The pants pattern I used is also from simplicity 2677. I find it has a very good fit, which is unusual for any of the big three pattern companies. So I will be using this pants pattern a lot. I did have to add 1" because Zoe is very tall. This might give you a clue as to how many Abbies I have made. I am so happy this pattern goes up to size 8. As Zoe wasn't ready to give up her favorite top. 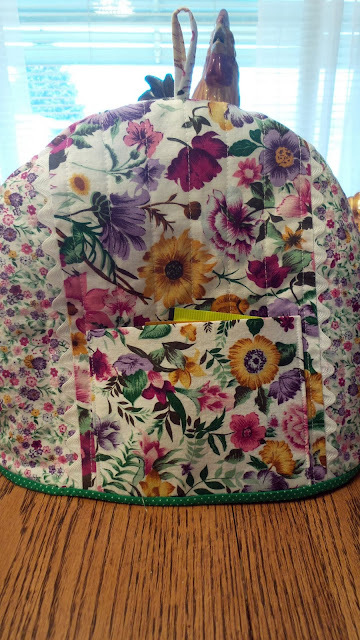 Sometimes I can really mess up, not just in sewing sometimes life can get rough. I just had to share my today boo-boo. I make the dog's treats, usually I use turkey dogs, as they are cheap and fat free, but I was given some sausage by a person didn't care for it and thought maybe the dogs would like it. The way I make the treats, is to slice them put them in the microwave and dry for about 3 minutes. They come out as little hard treats I can keep in a container. These sausages were pretty big, so I am thinking maybe 4 minutes would be needed to dry them. What I didn't take into consideration is the fat content!!!! So what did I get after 4 minutes? A kitchen filled with smoke, little black treats that are hard as rocks and even now a house that smells like it does when I try to cook supper. Oh yum-- well the good side? The dogs love them. I want to share with you my new favorite pattern for Zoe. It is not very often I find a pattern that I want to make over and over but this Simplicity pattern has so many different variations. Oh I better share the pattern number it's Simplicity 2677. I have only made the top version so far, but as you can see, this will be a fun pattern to play with, to change up, to dress up or dress it down. she has been asking for something for valentines day, so I added a pair of pants along with the valentine print. We will see tonight how it all fits, keep your fingers crossed. Since she outgrew the Bonnie Blue "Jillian pattern I have not found a pants pattern I am happy with. I do have another Jillian on back order and a very special outfit planned but thats a story for another day. What is this? This is my new project. Since I purchased a new sewing machine A viking Sapphire 870 quilt, I have to make a new sewing notebook. So I have gathered my 'stuff' which includes my favorite sewing books. I have many, but these are my favorites . I will need to make new samples of the stitches my machine can do, which at last count is somwhere around 800 stitches. That is not counting the stitches I can combine to make new stitches. I do feel a little overwhelmed but spending sometime playing and making samples should help me get comfortable. If you have never made a stitch notebook it might be something you want to put on your to do list. All machines sew a little different, and making samples will help you recall a stitch you like or one that worked well and you want to do it again without taking time out to test. As you know, I shared a big boo-boo I made when making a strip jumper. Here is what it is supposed to look like. You will notice two jumpers, that is because when I found the mistake, I was able to make a correct size three jumper just from what I had cut off. I wish you could see the fabric, it has sparkles all over it. Thank you for sharing some of your mistakes, sure makes a person feel better and not so alone. I wish I could promise somehow that I won't be doing any more mistakes, that from now on my sewing will be perfect, but then that would not be true. I am sure will will goof many more times in the future, just so happy this was an easy fix. Well, except for the one that flew off to Arizona, we will see what happens there. I was making a jumper sundress for Chloe from a pattern I had from You Can Make This, I have made the jumper before and didn't have any problems, so I proceeded on. When it came to cutting the strips, I read the amount to cut and the length. As the dress came together, it was looking funny to me, I re-checked, the measurements, why did it look so big. I decided it was just supposed to be long even though the measurments said this was knee length. After Zoe saw the dress, she wanted one too. So I started one for her, again the strips looked wrong. I even had to get out of bed one night go to the sewing room and read the instructions, something was wrong. Well, after a couple of days and this is so embarrasing, I finally look to the left and there in tiny, tiny print was the size to CUT the strips, the bold number, the one I could see was the finished length of the dress, measured from the shoulder no less. I was able to recut Zoe's dress but Chloe dress is on it's way to Arizona. I have told my daughter in law to please mail the dress back and I will fix it. This dress will need to be re-made. I noticed this morning a huge sewing mistake. I mean this one is a biggie and I feel really stupid!! I will share the mistake with all of you but not quite yet, first I have to find a fix for the mistake, then and only then will I tell my secret. I am sure(well almost sure) I will be able to fix the mistake. 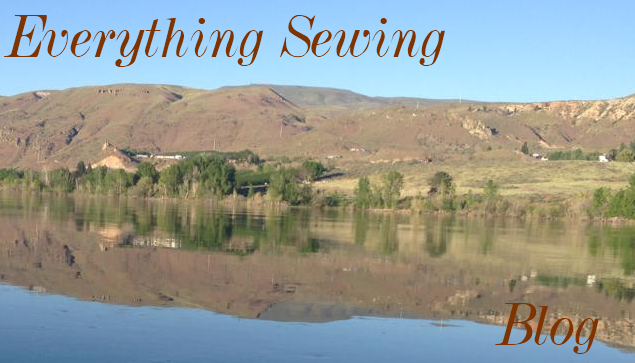 Makes me wonder, what was your biggest sewing mistake and how did you fix it? I knew I would probably be messing up some since I have not sewn for six months, guess I didn't dissapoint myself. So for today I want to think of summer and flowers and will share a picture of a very valuable sunflower. What makes it so valuable is, the seeds came for a friends garden and that friend lives in New York!! that's a very long way from here. Sharing the seeds of friendship. While sorting pictures I came across these: Could that much time really have flown by already? The first picture is Zoe's first bishop. 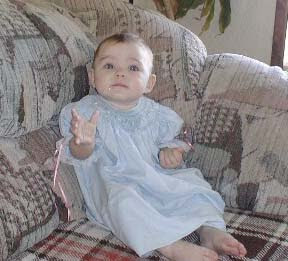 I had not sewn/smocked for many years and here I was faced with my first grandaughter. What else was I to do but dust off the pleater and try my hand at smocking once again. Maggie Bunch came to my rescue and held my hand through this first bishop. I then was hooked, and knew she needed yet another bishop, this one was to close at the shoulder. Yikes how to do that without buying another bishop pattern!! Again, Maggie to the rescue, just use a regular bishop pattern and move the closure to the shoulder. That made for interesting pleating but was doable and now my little one had two bishops. I was getting braver now, and wanted to try my hand at more embellishments. What could be more challenging then those bullion roses I kept seeing. 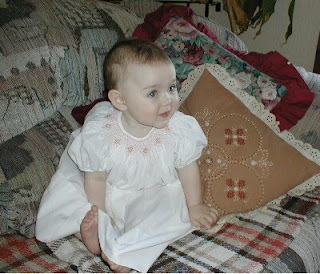 with her first birthday approching I new she would need a new birthday dress and I knew it would need to be smocked. So, I set about making bullion roses and I must say, those also are addicting and now need to be added to almost everything I sew. So there is but a brief time spent in the memories, of what has become a passion of not just sewing and not just smocking, but of a way I can show my love of family. That is making memories.